Usually all that talk you hear from coaches about winning and losing not being important amounts to so much lip service. Against Minnetonka, though, teams have developed a different standard. After a 3-2 holiday tournament loss to the No. 1 (Class AA) Skippers on Jan. 1, the Hornets’ locker room resembled a frat party more than it did a morgue. “I don’t know why they would be down,” Hornets coach Curt Giles said about his players. “They worked hard and did everything they could possibly do, and they got beat by a good team. The scene was similar last week when Eden Prairie came out on the losing end of a 1-0 defensive duel with Minnetonka. Right now, with the playoffs more than a month away, close is good enough for teams sizing themselves up against the best. It’s no coincidence that the teams that have given the Skippers their best challenges, Edina and Eden Prairie, sit at No. 2 and 3, respectively in this week’s Class AA rankings as voted on by a panel of coaches and media members from throughout the state. In Class A the rankings received only a minor shakeup, with Warroad dropping a spot after losing to East Grand Forks in one of the biggest upsets of the season. Three more highly thought of opponents, three more wins for the Skippers. 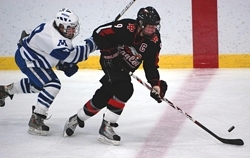 Minnetonka looked worn down in the final two periods of its 1-0 nailbiter against Eden Prairie, but it gathered enough orange slices and energy drinks to beat Holy Angels and Duluth East by a combined scored of 12-4 over a three-day span. Defensemen Justin Holl and Andrew Prochno, both potential NHL draft picks, have 26 and 15 points, respectively. Hornets coming off so-so week in edging Chaska/Chanhassen and skating to a tie with Holy Angels. Game against No. 10 Benilde-St. Margaret's one of the few this week matching top 10 teams. Charlie Taft breaking away from pack as team's top goal scorer with 10. Eagles play two of their biggest Lake Conference challengers this week in Apple Valley and No. 9 Eagan. Finally starting to flex some serious offensive muscle, scoring a combined 18 goals in back-to-back wins over Rosemount and Lakeville South. Kyle Rau has 20 goals, 13 more than Mitch Rogge, the Eagles' No. 2 goal scorer. Pioneers beat a couple of tough, talented teams in St. Thomas Academy and Tartan to remain one of the state's hottest teams. Hill-Murray is much like Edina in that goal scoring is spread between three lines. Defensive corps, led by Chris Casto, Jordan Johnson and J.D. Controneo, not lacking in depth either. Tim Shaughnessy's 1.61 goals-against average ranks seventh among state goaltenders who have played six or more games. Superb center Nick Bjugstad was ranked No. 12 among all North American skaters this week by the NHL's Central Scouting service, but, stunningly, he ranks second on his own team in goal scoring with 12 behind linemate Jonny Brodzinski's 13. Eric Scheid has nine goals and is among the most underrated forwards in the state. One of the state's best rivalries gets cranked up on Saturday when the Bengals host Centennial. Trojans feature emerging star in sophomore Mario Lucia but plenty of other skilled forwards, including Tony Cameranesi and Scott Holm. Game at Burnsville on Saturday figures to be a great final tuneup before brutally tough Lake Conference play begins with a game against No. 2 Edina. Jaguars spent some practice time honing their defensive game, and it showed in 1-0 triumph over Wayzata. So what happened in the 6-4 loss to Lakeville North two days later? The answer as to how good this Jefferson team really is will be revealed on Jan. 19, when the Jaguars travel to No. 3 Eden Prairie. In a week that spotlights several of the state's best rivalries, the Rams host old rival Warroad in a showdown between two of the state's top teams. Roseau should be rocking as the Rams play what is always one of their biggest games of the season. Wildcats just one of two teams in the state, along with Minnetonka, that remains unbeaten against high school competition. That loss on the record came courtesy of the U.S. Women's Olympic team. Michael Zajac, just a sophomore, is the team leader in goals with eight and in points with 18. Tommy Bodeker's .939 save percentage is the fifth best in the state. Red Knight's handed Spring Lake Park its first loss of the season last weekend. Their reward? A date with No. 2 Edina. Question as to whether Benilde-St. Margaret's belongs in the top 10 should be answered in that game. Cadets' meat grinder of a schedule includes yet another rugged Class AA opponent this week in Cretin-Derham Hall. If it's hard to believe a four-loss team could sit solidly atop the rankings, then you haven't seen St. Thomas Academy play. Top six forwards, as a group, as good as any in the state. Mustangs are the type of team that make goaltenders pause and reconsider their chosen position. They haven't scored less than four goals in a game this season and have scored five or more seven times. Hawks make a move into the top three after going 3-0 during a tough week that included wins over rival Duluth Marshall and a road trip to International Falls. Potential sectional final preview set for Saturday against No. 9 St. Cloud Cathedral. After sitting at No. 3 all season, Warriors dropped a spot after what might have been the most stunning loss of the season -- a 2-1 setback at East Grand Forks. Warroad rebounded nicely, however, with wins over St. Cloud Cathedral and St. Cloud Tech. Now it's Roseau Week, and while the huge rivalry game no longer serves as a playoff preview it does provide a big momentum boost to the winner. Zephyrs outscored their three opponents 22-1 last week, but that string of blowouts is likely to end in what should be a tight game against a solid Tartan team. Brandon Zurn and Charlie Adams have combined for 32 goals, and form one of the best one-two offensive punches in the state. Blue Devils host longtime rival Hibbing in what is almost always a close game no matter the type of season either team is having. Junior center Garrett Hendrickson made NHL midseason scouting list of top prospects and sits at No. 7 in the state in scoring with 39 points. Prowlers' stingy defense goes head-to-head with Park Rapids and the high-scoring Coburn brothers, Tucker and Sam, in intriguing Tuesday night matchup. Huge home game against Section 8A rival Warroad on Jan. 21 is looming. If there was a "quality losses" category in the statewide statistics, the Hilltoppers would undoubtedly be among the leaders. They gave Hermantown all it could handle in a 5-4 loss, then lost a 1-0 duel with Grand Rapids. Tough games continue to dot the schedule, with one of the next coming Saturday in Bemidji. Crusaders averted rare three-game losing skid, barely, by rallying to knock off Litchfield/Dassel-Cokato in overtime. They have great opportunity to build momentum for playoffs, not to mention register a huge upset, when they travel to Hermantown on Saturday. Bears make their first appearance in the top 10, but the traditional small-school power is no stranger to Class A success. Biggest challenge in coming week might be to not look ahead to Jan. 19 game at Minnetonka.